My closies Zeina and Rasha wanted to throw a baby shower, but they knew me well enough and realized I wouldn't be too keen on the traditional baby shower thing.. So they decided to organize a unisex get together at our home instead.. With unisex I mean a small group of close friends, ladies & gents, enjoying an afternoon lunch, followed by chilling by the pool.. 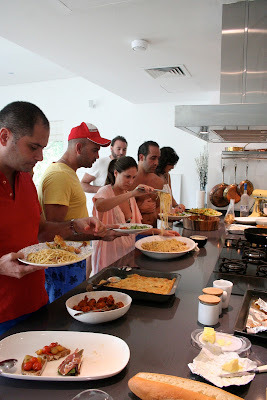 The menu included Bruschetta, salads, Spaghetti al Vongole, Tenderloin Truffle Sandwiches, Chicken Wings & Drumsticks, Chicken Pie, Olive Oil Cake and Fried Ice Cream.. What a treat :) The catch was, that for once, I wasn't allowed to do anything - nothing at all!! It felt so weird not preparing anything, whether cooking nor organizing, as the ladies prepared it all and little miss D was completely spoiled having a beautiful glass of mixed fruit juice :) The food was delish, the mood amazing, the music divine and the day incredible.. Thank you so much my girlies!! Love you!! And a big fat thank you for the lovely gifts friends brought along for mini Soubra ;) It's funny because on days like these you realize what makes you happiest, and that's being surrounded by family and friends. Everything else really is secondary.. Yes, my pregnant state is making me more emotional than I already am, but it's true. So to health, love, family and true friendships!